We've gone from a slow Saturday to a lazy Sunday! I think the two elder Lundbury's have worn out the young 'un! I will admit it has been a whirlwind of a week, and we have really packed a lot of sight seeing into our days. I woke up this morning with a nasty cold--sooo NOT good timing. I haven't had a cold in years and years! Oh well, it won't stop us from having a great day in Paris. We started out our day with a quick Metro ride over to Notre Dame Cathedral. 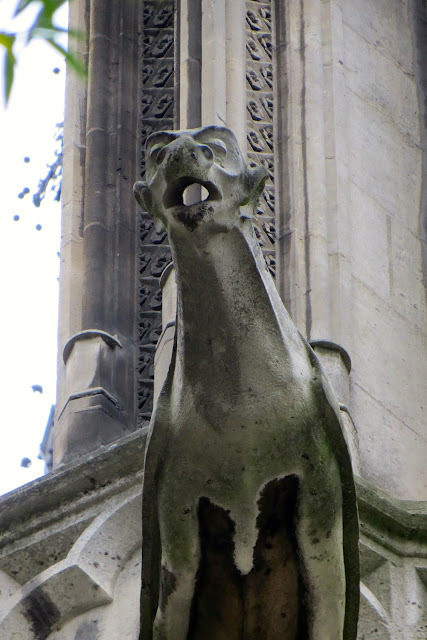 We took time to walk around the church and admire the beautiful flying buttresses and the amazing gargoyles. In the corner of the small park behind Notre Dame, we found this toilette. I love the faux bois design--so French! We planned to go the The Gregorian Chang Mass at 10 a.m., and we were plenty early. We walked in a took some seats in the back of the church and caught the tail end of the 9 a.m. Mass. The church was maybe 1/4 full, but that quickly changed as the Gregorian Mass started. I really enjoyed the lovely music and "chanting". We didn't stay for the whole service, but quietly left after the first 45 minutes. 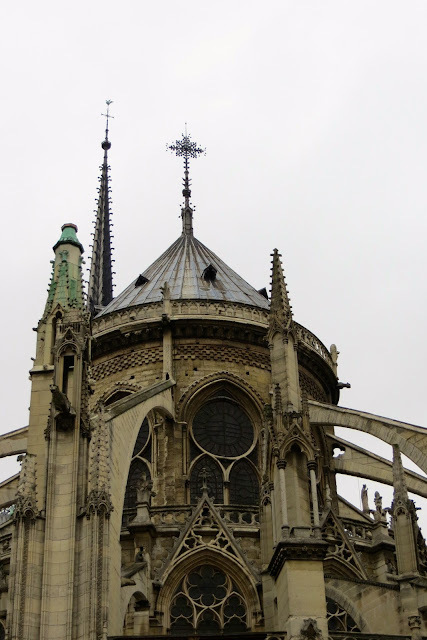 We hopped right back on the Metro and headed over to the Catacombs, which is a fair distance from Notre Dame. 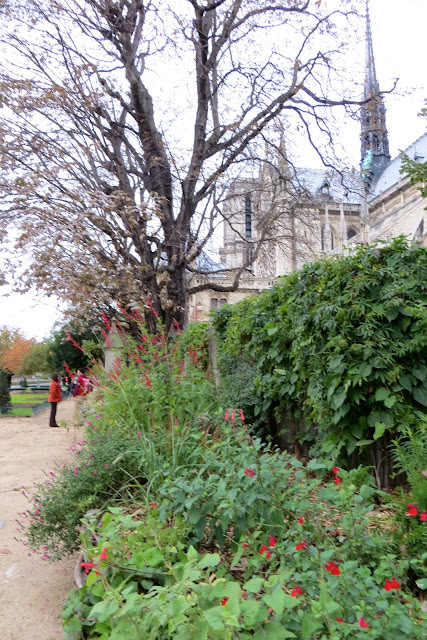 A couple of line changes later, we came out of the Metro and easily found the entrance to the Catacombs. A minor problem--they are closed for an undetermined period of time--something about a problem with their air conditioning/filtration system. Matt was really disappointed, as this was one of the important things on his "things to do in Paris" list. Darn! So we stopped by a nearby McDonald's and drowned our sorrows in a cappuccino and a pastry. Really, just an excuse to use their restrooms! Now what to do? We decided to Metro back to the apartment, have a little rest and get some lunch. I rested a bit while David and Matt went to buy some baguette sandwiches for lunch. They couldn't find a takeout place open, so they were resourceful, went to the grocery and bought makings for sandwiches. Baguette, ham, tomatoes and cheese--they were delicious! David and I walked down to a pharmacy in our neighborhood to get something for my cold. The pharmacist was very knowledgeable and helpful, and he asked all the right questions. His English was great! I left with a French cold medicine and some good ole Vick's Vapor Rub! He told me that many people have the same "crud" (my word) right now. 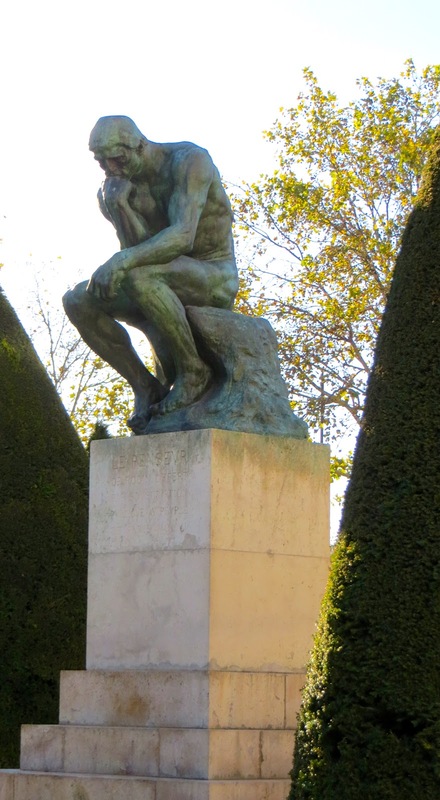 We decided that we had just enough time to go to the Rodin Museum to see "The Thinker". 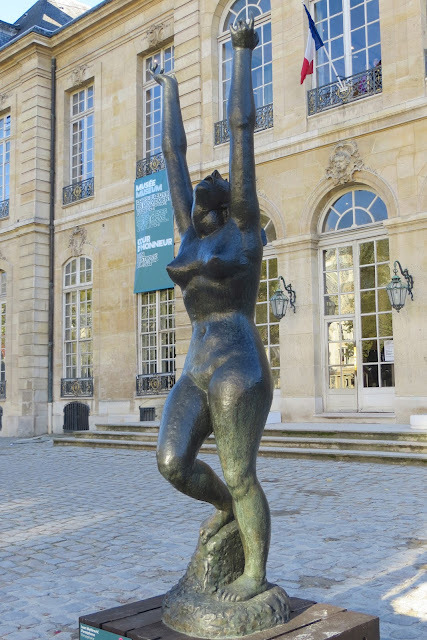 We Metro'd over and found that it was "free Sunday" at the Rodin--lucky us! I think Matt was a little underwhelmed, he thought it was going to be bigger! 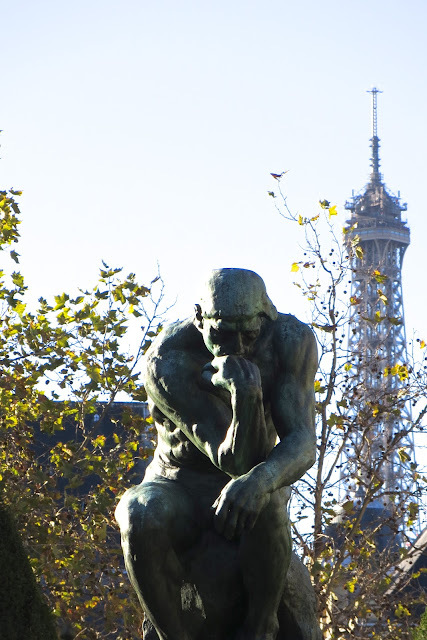 I think I love Paris! Persephone. She looks absolutely triumphant! I think this was was just weird. Titled "Job"
We were all winding down a bit, especially Matt--I think he's getting this nasty cold, too. Darn it! We're now back at our apartment, I'm going to rest a bit while my guys do a load of laundry. Then we'll go out for Matt's last meal in Paris. We'll make it something yummy and memorable, I hope! Two hours later, the guys are back with clean laundry, and I had a great nap! Ready for Matt's last dinner in Paris, and he gets to choose. We checked out the restaurants around our apartment, but nothing caught his eye. He chose to go back to the restaurant we ate at on our first night here, and then again on his birthday. We have had consistently good food and great service there. We started with an appetizer of foie gras on toast--it was very good, but not the best we'd had. Matt had never had it, and he said it was pretty good stuff! I ordered the farm raised pork steak with mashed potatoes, which was just perfect! I couldn't begin to eat it all, but my guys helped with the potatoes! David ordered his same composed salad with duck confit and goat cheese on toast. I 'm pretty sure he's going to be asking me to serve his breakfast toast with goat cheese broiled on top when we get home! He is seriously hooked! A bottle of wine? You bet! Dessert? Of course, especially since we broke the rule yesterday and didn't have any! We ordered chocolate mousse and creme brûlée and shared--they were both just yummy! It was a short stroll back to our apartment, and early to bed for The Three Travelin' Lundburys. Matt has a 6:30 am taxi to the airport--it will be a looooong trip home for him. 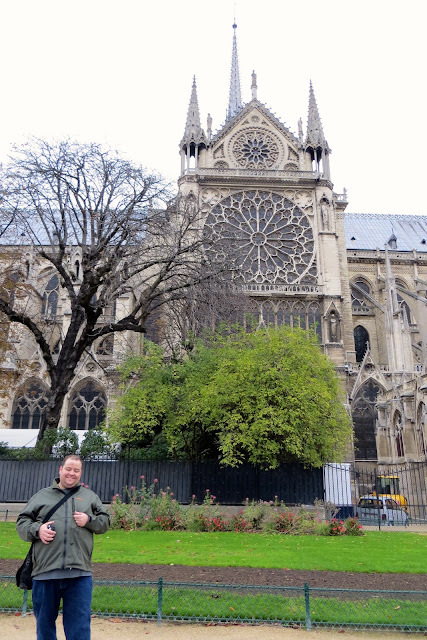 David and I have one more precious day in Paris, then we are off to Istanbul Tuesday morning. We are looking forward to exploring a new city and an interesting new culture! Stay tuned for Tales from Turkey! Sorry to hear that you caught a cold and I hope it goes away quickly. Sounds like you made Matt's last day in Paris very memorable even though you had to change a few things because of closures. Dinner looked really tasty. Safe travels home Matt. We will be watching for your adventures from Istanbul. Catacombs.... McDonalds......Catacombs..... McDonalds...... hum.... what's wrong with this picture? Thanks for all the pictures Di. Sorry to hear that you and Matt are catching/have a cold. Hopefully your French meds will fix you right up. Love the pictures of the rose and the flying buttresses - makes my soul sing. What a wonderful trip you have had so far and what a blessing to be able to share it with Matt and Dave. Hope Matt has a safe trip home and that his long trip won't do him in..... I finally caught up with all of your posts and look forward to your wonderful stories as you visit Istanbul. Stay well and big hugs to you and Dave.